Ludleth di Courland è un Lord dei Tizzoni e un NPC in Dark Souls 3. Può essere ucciso, ma ritornerà in vita ricaricando l'area. Consegnandogli la Fornace per il Trasferimento, gli sarà possibile trasferire le Anime dei Boss in Armi e Oggetti. Se non gli viene consegnata la Fornace prima di piazzare tutti e 4 gli altri tizzoni dei Lord, non vi sarà più possibile trasporre le anime dei Boss fino al prossimo nuovo viaggio. Ludleth muore dopo aver piazzato i 4 Tizzoni dei Lord, ma si potrà comunque trasporre le anime dei Lord se gli è stata consegnata la Fornace in precedenza. Interagendo col trono vuoto vi consentirà di trasporre le Anime dei Boss. Potrete trovare Ludleth di Courland all'Altare del Vincolo, seduto sul secondo trono partendo dalla sinistra. Oh, thou’rt unkindled, and a seeker of Lords. I am Ludleth of Courland. Look not in bewilderment as I say… I linked the fire long ago, becoming a Lord of Cinder. If substantiation be thy want, set thine eyes upon my charred corse. This sad cadav’r. No need to be coy, have a closer look." Fret not, fret not. My feet are here firmly planted. For I am a Lord, and this is my throne." Knowest thou of our purpose? 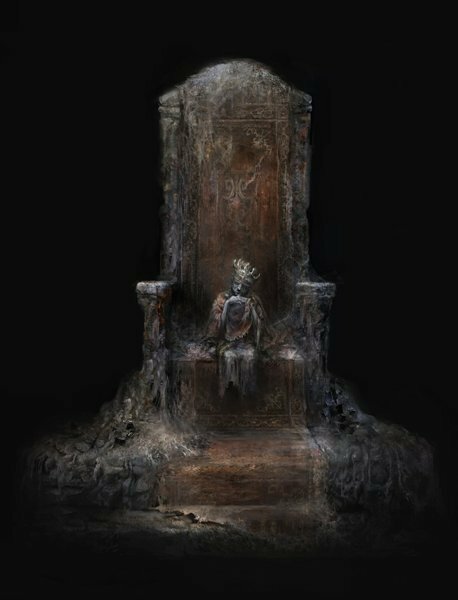 Five thrones will take five Lords, as kindling for the linking of the Fire. The fast fading Flame must be linked to preserve this world. A re-enactment of the first linking of the fire. So it is, I became a Lord of Cinder. I may be but small, but I will die a colossus." Treat the Fire Keeper not with discourtesy. She is much like thee. Prisioners, both, kept to link the fire." "Now, now, do not be away overlong." Listen, this might pique thine interest. Before I was a Lord of Cinder, I was a student of transposition. The process of extracting, and coalescing the essence of a soul. A forbidden art, that once left a foul stain upon Courland's honor. Tis an art that grants powers once thought unattainable. Most transposing kilns were lost with Courland, but this place is a crossing for all manner of cursed objects. If thou happen'st 'pon a transposing kiln, bring it to me, quick." Oh, belike it is… a transposing kiln in thy possession. Seen better days, but, methinks it shall suffice. Now bring me a twisted soul. Transposition is the art of extracting, and coalescing the essence of a soul. In transposing a twsted soul, its true power transferreth to thee. Thy purpose is to seek Lords, and slay them. What's to fear in a little transpositon, now?" Ahh, most illustrious Lordseeker. Or should I say, Lord-Slayer? Fine kindling for the thrones , is it not, each soul truly worthy of Lordship. And all slain by thy hand. To bind them them to their thrones, even in death. Oh I have no qualms. For as we to our thrones, thou art to thy duty. In fact, methinks thou'st help helped these poor Lords along their rightful path." Ahh. Found her, did we? And the black eyes that shimmer within, I see? Tis as if it were but yesterday. We did all we could to spare her from them. Much has happened since. Mayhap I should apprise thee... Of what the thin light of these eyes might reveal to the eyeless Firekeeper. Scenes of betrayal, things never intended for her ken, visions of... this age's end..."
The eyes show a world destitute of fire, a barren plane of endless darkness. A place born of betrayal. So I will'd myself Lord, to link the fire, to paint a new vision. What is thine intent?" I took the mantle of Lord of Cinder of mine own volition. I speak these words with pride. Choose thy fate alone. Seize it with thine own hands. All the more, should thy fate entail such foul betrayal." Ahh, it singeth, to the bone, it hurts... Please, help me. Be done with me... No, gods, no, I cannot bear it... It burns, burns, help me..."
(After placing all Lord Cinders) "See ye not? I am a lord... A wee flame, belike, but I shoulder the world... Forgive me. Oh please... I am not to blame. I'm not"
Ah, beg pardon. I must have dozed a while. So, happened upon any twisted souls?" Ahh, well met. Thou'rt at last returned. Knowest thou the name, Anri of Astora? The brave lad/girl left this, as thanks. (Sword) Though gave no elucidation... So. Happened upon any twisted souls?" (Leave) "Now, heed this little warning, from this little lord. Seek not the boy. She knoweth her faith. What will become of her upon her duty's end. She would not wish thee follow her." Ahh, well met. All is as planned, is it not? Five lords for five thrones... Glory be, my Lord-slaying Champion. It is all thy doing. The stage is set for me to play my part as Lord, too. Go. Speak with the Fire Keeper." (Wishing for a world without Fire) "Ahh, well met. All is as planned, is it not? Five lords for five thrones... To think others might ne'er be raised... And I, of the Last Lords, a rather little lord, most undeserving of the honour. Speak with the Fire Keeper." L'incisione sul suo trono è "Ludleth l'Esiliato". Sembra esserci sangue o fuliggine sul tessuto su cui è seduto. Se gli parlate dopo che è rinato lui starà facendo un sogno riguardo a quando lui ha vincolato il fuoco nel suo mondo. Ludleth parla una forma di Inglese più antica degli altri personaggi. Courland(Curlandia) era una regione storica che esisteva sull'attuale territorio della Lettonia. Ludleth non ha le gambe.